“Having been woken on Saturday night by howling winds and rain, I was quite relieved it was a Sat race and not Sunday…you don’t go to Mallorca to race in wind and rain! A wave start saw the pros heading off 10 min before all the girls; with a flat, calm sea and starting in my rightful place towards the middle/back of the group, I stayed out of trouble for once and had a pretty uneventful swim. I even swum past a few girls….that was a real novelty. Was really surprised how many bags were still in transition as I went through T1 but having forgotten to start my watch, I had no idea of my split. 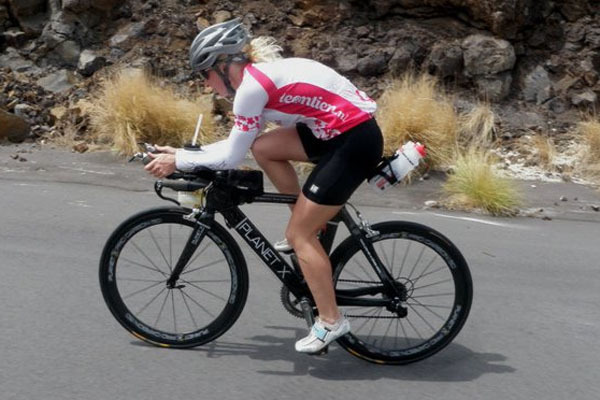 I passed quite a few girls in the 1st 12-15miles on the bike, however I then had a girl in my age group blast past – I wasn’t going to stay with her so let her go hoping she’d either blow up (not literally), or I’d see her on the run. Worked pretty hard throughout the rest of the bike course, the climbs were great, descents great fun and flats into the wind hard work at times but overall really enjoyed it. Was dreading the run knowing I’ve been off form so didn’t bother with my watch. Came out of T2 and fell into step with Yvette Grice – almost got quite excited as she’d had a 10min head start on me til she said she was finishing her first 5k lap as I was just starting! However I did reckon that only put her approx. 10min ahead overall which gave a me a kick up the backside to keep working – after chatting for 5min or so though (this is what girls do when they race ), I decided she had far more spring in her step than I did so dropped back. Held it together with a dodgy achilles and minor stomach cramps for a 1.40 run split, 10min off where I should’ve been, but enough for 3rd place, missing out on a win by less than 2min! This entry was posted on Tuesday, May 17th, 2011 at 6:35 am	and is filed under All Posts, Planet X Bikes, Products, Riders. You can follow any responses to this entry through the RSS 2.0 feed. Both comments and pings are currently closed.